Pleasant Home Foundation in Oak Park, IL, seeks an Executive Director who will be a strategic and creative nonprofit cultural leader to work with the Board to grow earned and contributed revenues and develop innovative and exciting cultural programs to achieve the goals set forth in its new strategic plan. The Executive Director will be directly responsible to the Board of Directors for carrying out the mission of Pleasant Home Foundation and managing its business and affairs. The Executive Director shall spearhead Pleasant Home Foundation’s efforts to realize its mission by expanding the organization's programmatic direction, public outreach and support, facility operations, business development, organizational management and fundraising activities. This position will be responsible for defining the duties of any additional staff positions that are created and for supervising the work of staff in conformance with policies and budgets established by the Board. 1. Strong leadership skills and effective managerial and fundraising expertise. 2. Demonstrated history of generating and cultivating sources of financial support. 3. Working knowledge of nonprofit fiscal management, with experience using Quickbooks. 4. A minimum of three years' experience supervising staff and working with a Board of Directors. 5. Proficiency at building partnerships with organizations and individuals, locally and nationally, with whom the organization shares common interests. 6. Experience with marketing and outreach, media relations and public speaking. 7. Strong in written and oral communication, interpersonal skills 8. Prior experience working with volunteers who bring content expertise to an organization. 9. Knowledge of and experience in restoration and operations of historic sites preferred. 10. An undergraduate degree is required; one of the following areas desirable: historic preservation, nonprofit management, arts administration, marketing, philanthropic studies. 11. Ability to work evenings and weekends as needed for meetings and programs. 1. The leadership and management of Pleasant Home Foundation. 2. Management of the Foundation’s finances, budget, business and mission-related affairs and for implementing Board directives and initiatives. 3. Preparing the annual budget for approval by the Board of Directors. Management and approval of expenditures within a Board-approved budget. 4. The ongoing development and cultivation of the Foundation’s donor relationships and membership support. 5. Writing grants and reports to build foundation and government support. 6. Leadership in planning and executing the organization’s restoration and facility upgrade efforts of Pleasant Home. 7. Ensuring that programmatic direction fulfills goals of the strategic plan. 8. Marketing the activities of Pleasant Home Foundation. 9. Supervision and management of the staff to maintain the efficacy and excellence of the organization's programs, tours, volunteers, events and website. 10. Advising the Board on policy and implementing the strategic plan. 11. Working closely with the President of the Board to foster a productive working relationship and timely communication between staff and the Board and its committees. 12. Working closely with the President of the Board to prepare agendas, minutes, financials reports and background material for Board of Directors' meetings. 13. Conduct searches, hire and review staff. Compensation: Salary is in mid-$40K with no benefits. Application Process: Please submit cover letter, resume, salary expectations and contact information to Barbara Gordon, PHF Secretary at barbara.gordon1101@gmail.com. Cover letter should outline how your background and experience meets the requirements of the position. Pleasant Home Foundation is an Equal Opportunity Employer. Pleasant Home is a Prairie Style house museum located in Oak Park, one the nation’s most architecturally significant villages. Designed in 1897, by architect George W. Maher, the home is a National Historic Landmark and the only Maher building open to the public as a museum. 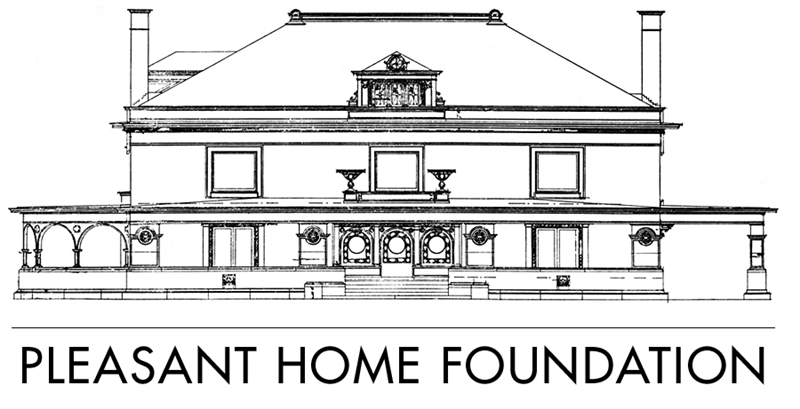 Pleasant Home Foundation is dedicated to restoring, preserving and operating Pleasant Home as a historic house museum while presenting a year-round schedule of tours, educational programs, community events and cultural performances. Our Mission: To surprise and delight visitors through historic interpretation and restoration of Pleasant Home.